Housing MTZ MTZ fork PPC-1221 Sat. MTZ-80 tractors MTZ-82 and most of their modifications are completed almost entirely manual transmission. 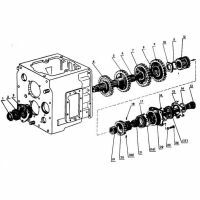 Transmission is represented by nine steps and two diapazonayami as well as with a reduction gear. Number of gears is eighteen forward and four back. There is also an opportunity to establish creeper. However, there are also tractor modifications issued after 1985 with an installed hydrocontrolled transmission and switching are already under stress. This box allows you to select one of four programs in the framework of the four speed ranges with it without turning off the clutch itself. Primary shaft and secondary shaft are located in a box, or rather in its housing on a single axis. An intermediate shaft coupled to the shaft of the first transmission and the reverse gear are arranged in parallel primary and secondary shafts. The primary shaft is fixed by means of two bearings, one of which is mounted in a glass gearbox housing, a second bearing and the input shaft connected to the output shaft in the forward ends of the latter.